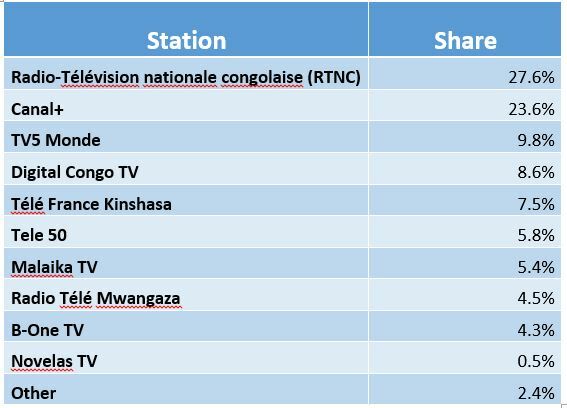 We are pleased to provide you with a Media Measurement report with audience statistics on Top TV Stations and Top Radio Stations for Quarter 3 2016 in DRC, where the GeoPoll Media Measurement service is currently available . The graph above shows that Radio Okapi still takes the lead in ratings nationally as in Q2. Radio Okapi has its highest ratings between 6-8AM with an average of 13.33. RTNC secondly leads in ratings nationally between 6AM-10PM. There is a stiff competition amongst the other stations nationally. Radio Okapi achieves the highest share nationally with an average of 36.0%. RTNC has the second highest share with an average of 11.9% which is a slight increase from the share it achieved in Q2. 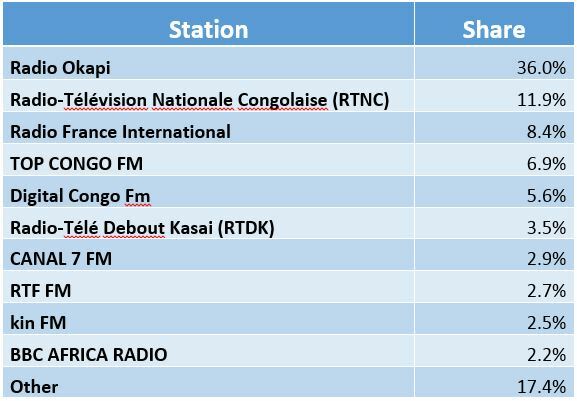 Radio France International achieves the third share with an average of 8.4% followed by TOP CONGO FM with an average of 6.9%. The graph above shows that RTNC leads in ratings nationally except at 9PM where Canal+ takes the lead. TV5 Monde achieves the third ratings consistently, but Digital Congo TV captures the third position at 7.30PM. There is a stiff competition amongst the other stations. RTNC achieves its highest ratings at 7.30PM with an average of 6.03. GeoPoll also examined average share across the entire day during Q3 2016. RTNC leads the way averaging 27.6% of viewers followed by Canal+ averaging 23.6%. TV5 Monde achieves the third highest share with an average of 9.8% followed by Digital Congo TV with an average of 8.6%. Use the below form to contact us, to subscribe to GeoPoll Media Measurement, request a product demonstration, or be notified when it launches in other countries. Please be as detailed as possible about your media measurement needs so we can respond promptly. GeoPoll Media Measurement is currently available in Democratic Republic of Congo, Ghana, Kenya, Mozambique, Nigeria, Rwanda, Tanzania, and Uganda.